Welcome to the first article of Alcula’s blog. Here you will find fresh information about the website, it’s new features and tools as well as general news on the world of calculators, math and other things related. The most important piece of news for the site is the addition of the new Scientific Calculator. This is what this post is all about. It has taken many months of development and it’s far from being complete but even at this stage it is the most complete tool for making calculations online. The current version is available here. Fractions calculations – The new scientific calculator is a powerful fraction calculator: The best way to maintain precision is to use fractional values throughout the calculations, only converting the final result, if necessary, to a floating point number. This calculator does just that. When you specify the parameters of your expressions as fractions, the calculator, when possible, attempts to compute the result using fraction arithmetics. Before performing any calculation, all fractions are simplified. Then, the expression is evaluated using integer math. All intermediate results are also simplified to make computations quicker and to avoid overflow. History – The most common comment that Alcula’s visitors sent about the old Scientific Calculator was that it would be nice to be able to view the history of what they already done so they could check if they made a mstake in a previous step. Many of our users are students that use the site to double-check their homework. The new calculator displays an unlimited (well, only limited by your computer’s memory) number of lines. From that came the idea that it would be nice, if a mistake was found, to be able to go back and correct the mistake without having to retype the whole series of expressions. This is where the next feature comes to your help. History Editor – You can scroll back to any expression you previously typed, click on it and modify it… All the expressions that follow are automatically updated reflecting the change you made. How cool is that? The ans(x) function, normally found on the most advanced real calculators allows you to access the results of previous expressions. This function works together with the history editor to provide the magic of the automatic updates. It’s a formula calculator. The most natural way of writing expressions is the way we are used to read them on textbooks: left to right, with the result displayed at the end. Only the very high end hardware calculators support this way of inputting an expression. 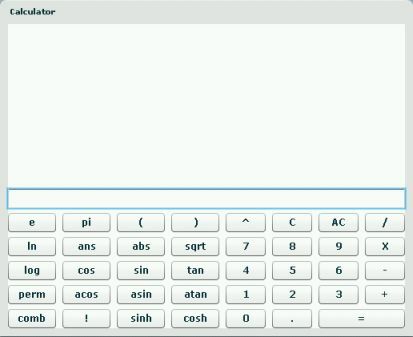 Fortunately, on a computer, this functionality is quite easy to program, so Alcula’s calculator can do it. You can, of course, use parenthesis to alter the order of calculations. Parenthesis are also used to specify the arguments of functions. Ok, so where is the catch?. Actually there is one. It’s a big program. The file is very large by internet standards. The current version is approximately 330Kb. This means that if you have a 1.5Mb adsl internet connection, if our server is not busy (it usually is, but we are working on that), it would take you a bit more than 1 second to load the calculator. If, you are on dialup though, it could take more than a minute and half before you can use it. This sort of download time can seriously test the patience of our most patient visitor. The good news it that after you load it the first time, it should be cached in your computer and from the second visit onwards, until a new version comes out, you won’t have to wait so long (On a side note, there is a nice download time calculator here). So, if you have a broadband connection, or are willing to wait, go to the new Online Scientific Calculator. First, though, check out the instruction manual. Please do send your feedback, on the blog or using the feedback form. It will really help make this tool better, especially during this phase of development. This entry was posted on Friday, September 25th, 2009 at 10:29 am	and is filed under New Features, Online Scientific Calculator. You can follow any responses to this entry through the RSS 2.0 feed. Both comments and pings are currently closed. Thanks for the kind remarks and for the suggestion. I have added the sidebar navigation today.